This is a natural evolution. Mobile games are providing richer graphics and gameplay and heading towards the living room fast. “There is a lot of pull in the marketplace for upselling mobile gaming to TV,” said BlueStacks SVP of Global Sales & Business Development, Apu Kumar. “We’re talking with everyone from TV manufacturers to cable companies to carriers.” While hardware and controller specs have not been announced, the company’s investors include Qualcomm, Intel and Austin’s AMD: makers of the chipsets for both the upcoming XBOX One and PS4 consoles, respectively. BlueStacks rolled out its “Layercake” Mobile-to-PC technology in 2012. Layercake has been downloaded over 10 million times since as part of the company’s popular App Player product. App Player is widely distributed as part of several premium brands like Lenovo, MSI, AMD, and Intel. Pre-orders for the GamePop console are currently live at GamePop.tv. GamePop is a subscription service from BlueStacks that gives users access to 500 top mobile titles for 6.99 per month. The game console is included free as part of the service through the end of June. Many of the games, including those in the Fieldrunners franchise ($2.99ea) are paid games on mobile. 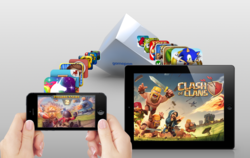 BlueStacks has said there will be over $200 in paid apps and games included free with GamePop. BlueStacks was launched in 2009 to bring the energy of the mobile app world to every type of device. The company is funded with 15M from Andreessen-Horowitz, Radar Partners, Redpoint, Ignition Partners and Qualcomm. BlueStacks was the upset winner of “Best Software at CES 2012 for its App Player software. Join their more than 1 million Facebook fans at Facebook.com/BlueStacksinc, or on Twitter at @BlueStacksinc.